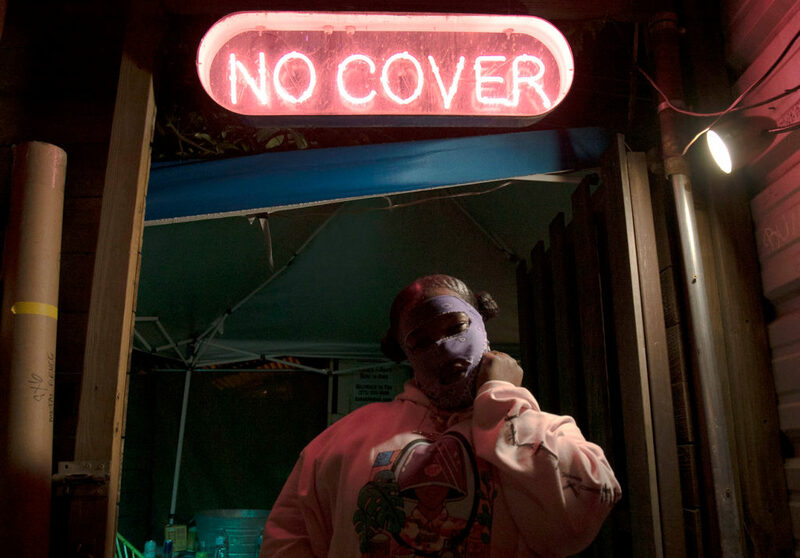 As a packed crowd gathered to watch her at the bar Cheer Up Charlies, Leikeli47 was off to the side of the stage, taking a brief moment to pause and collect herself in the seconds before being beckoned to the stage. She was building herself up, breath by breath. I couldn’t see Leikeli47’s own face when she said this. She was wearing her signature look: a bandana with cutouts — sometimes a balaclava — that revealed only her eyes and mouth. That night she wore a purple bandana, with the cutouts slightly ragged, plus gold hoops in her ears. We didn’t talk about the mask; she’s maintained in several past interviews that the face covering is meant to push the focus to her music. 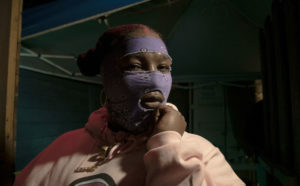 There’s a duality about Leikeli47, withholding certain details about herself, including her given name and age, but staying open to talking about her experiences. After a series of mixtapes that stretch back to 2012, she’s worked on a trilogy, beginning with 2017’s “Wash & Set,” which she said was about “not looking like what you’re actually going through.” In the 2018 follow-up, “Acrylic,” the rapper expanded beyond her personal experience to tell stories of black life from other parts of the neighborhood. The third album — “Shape Up” — is expected later this year. For “Acrylic,” Leikeli47 said said she wanted to “paint these beautiful pictures,” be it of black love, black women in nail salons, or black college life. “It’s kind of like my ghetto wonderland,” she said of the album. “You know where you are when you smell acrylic. You’re in my hood, you know,” she added. With each album, Leikeli47 is inviting listeners to learn more about her and make closer connections. She pulled up people onto the stage during her set, allowing them to shine with their own dance moves. When Leikeli47 urged people to “hit that pose” and “check your angle,” the voguers obliged. This month, Leikeli47 is embarking on her first headlining tour. The PBS NewsHour spoke to her about her upcoming tour, what career advice she’s ignored, and what telling people’s stories means to her. The conversation has been edited for length. How does it feel to be embarking on your very first headline tour? I’m a little nervous because it’s my first tour, but it’s exciting. I’m ready for it. I’m pumped. I’m ready to give the people energy. I hope that — I’m not even going to say I “hope” because I’m tired of using that word. We’re not hopers around here, we’re doers, and it’s going to happen. But I know that that crowd is going to be electric, and I’m going to give them electric right back. We’re talking when you’re about to go on stage. Do you ever get nervous before a performance? Every performance. A lot of people, like — when I say I’m nervous, they’re like, “Oh no, it’s not nerves, it’s excitement.” Whatever it is, I feel it. I feel it moving around, but it’s something about when you take that first step to go on that stage and it all leaves you because what’s most important is to people. My nerves leave when I see those beautiful faces that are just standing there to see me. It’s super dope, and I’m so appreciative of it. 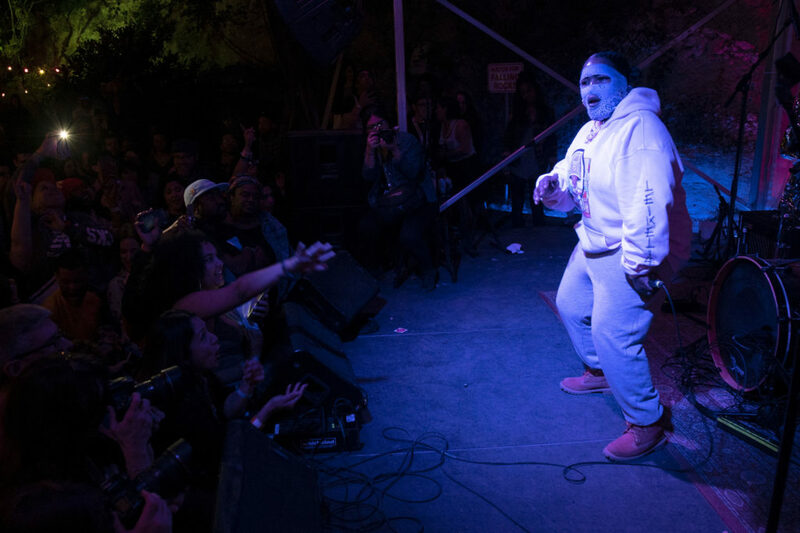 Leikeli47 performs on stage at Cheer Up Charlies in downtown Austin, Texas. A lot of people like to use this term “fan.” No, I don’t have no fans, I have friends, I have supporters, and I support them. We support each other, and that’s the beautiful connection between me and the people that I’m growing with and the people that are getting to know me. I feel like we’re building these genuine friendships. The tour is in support of “Acrylic.” How did this album build on your past work? This one right here, it definitely is more personal. I definitely dug a little deeper. In “Acrylic,” I wanted to dive into the stories surrounding the places that I grew up. It’s kind of like my ghetto wonderland. And “Acrylic” is that, acrylic represents the ghetto. I have this saying where, you know where you are when you smell acrylic. You’re in my hood. You’re in our hoods or whatever. And I just wanted to paint these beautiful pictures, whether it was surrounding black love, the love for our universities, just those stories, and I wanted to bring it to life. And I think that’s where “Acrylic” differs from anything else that I’ve done in the past. One thing about me is: I love to put who I am into the music. I’m a very shy person, a little introverted outside of this. It’s just super cool that I have art to be able to tell my story about the places that I’ve grown up, the things that I’ve been through, even stories of my friends. I wanted people to know that we come from these places, this ghetto, this hood you may think is bad. It’s not. It births creatives like me, like us. In one song, you say, “Walk in and smell the acrylic.” Why is that framing so vital to understanding the album? It’s right there, walk-ins welcome. It’s an invite for everyone to come in. It’s an invite for everyone to understand the black culture, my perspective of my black culture, of my black hair, of my black streets, of my black college experiences. These are stories surrounding the way I came up, but I want people to know that you are also welcome to come along this journey and learn with me because I want to learn about you, I want to learn about your culture. It’s time to blur those lines and really respect each other’s stories and embrace them or whatever. I wanted to tell stories so compelling that people would hear or even just read the lyrics and think to themselves, “Wow, I didn’t know this.” Because a lot of your favorite artists come from some of the most impoverished places. But because you see them at this pinnacle, at this height, you forget that this very place where that’s being neglected — our Flint, Michigans, our Chicagos, our Newarks, our Brownsvilles — there are so many gems, so many beautiful roses, so many beautiful diamonds that are just there if you took the time to really got to know people before you judge. Speaking about locations and these different cities, what was it like growing up in Virginia? So a lot of people know me as the Brooklyn girl. Like I said, I always sell out to my moments, so the very first song that people heard from me was “Your Entertainment” and that line says, “I left Brooklyn to come to L.A.” because that’s where I was. But I am a Brooklyn baby by way of [Virginia]. The crazy part is traveling up North and down South. What I learned was that there was no difference. The only difference was yourself, within people — humanity, we all have our differences, but when I went from Virginia to New York, it was the same place. The same thing that’s happening there is the same thing that’s happening here. It’s a little faster here. It’s a city. You know, it’s a little southern there, but I’m talking about the same things. People face the same struggles, and the same indifferences, just the same questions. It taught me just how much people relate, and they don’t even know it. How early did you start making music? I hope this doesn’t sound cliché, but all of my life I’ve grown up around music. In hindsight, I think back of just being a child and always kind of experimenting with sound. There was always someone around me to push it, to push me into it, whether it was a neighbor, whether it was just a friend that lived in my projects, whether it was my friend’s older brother, oldest sis — it was always someone to just encourage that little shy kid to keep going, keep going, keep going, so I’ve always done it. I’ve always just been this kind of geek that liked to dig in the crates. It’s important to study. It’s important to know things. You know, it helps mold you. It helped shape me and helps keep you sharp. It also helps keep you appreciative. So that was me. I used to love me some math and science. I was definitely a math and science kid, but I never wanted to do anything more than this, ever. I’ve been chasing this dream relentlessly since a child. Was there was any advice that you were given about your career that you completely ignored? You know what? Yes. And that was to give up. I completely ignored that. I’ve been told, “No, that’s not going to work.” “Oh no, that sound?” “Oh, why would you make a beat with just two sounds, that’s too minimal. Who’s going to dance to that?” And I had to prove those people wrong. So, that was some advice that I’ve never listened to, and advise anyone that wherever you are on your journey, if there’s someone telling you that you can’t, prove them wrong. I’m living proof. Prove them wrong. Go hard. Work hard. Prove them wrong. You mention that you put so much of yourself in your music, and I wonder how much of it is actually autobiographical. All of it. I love storytelling. I learned to how to tell my story and make it magical. But I’ve also learned how to tell other people’s stories because all stories are important. I’m a vessel, and there’s a lot of people out there that can’t tell their story, so that’s why I’m here, and that’s why I do what I do.